You’ve just rented or purchased a secure Pocket Wi-Fi Hotspot for your upcoming overseas trip. But, how much data do you need to purchase? We get asked this question a lot. What data plan you should purchase really depends on how much data you typically use on your smart devices. How Much Data Do You Use On Your Smart Devices? To decide how much data you use, take a look at how often you use your smartphone, tablet, or laptop and for what purpose. Data usage is the amount of data (things like images, movies, photos, videos, and text files) that you send, receive, download and/or upload on your smart devices. 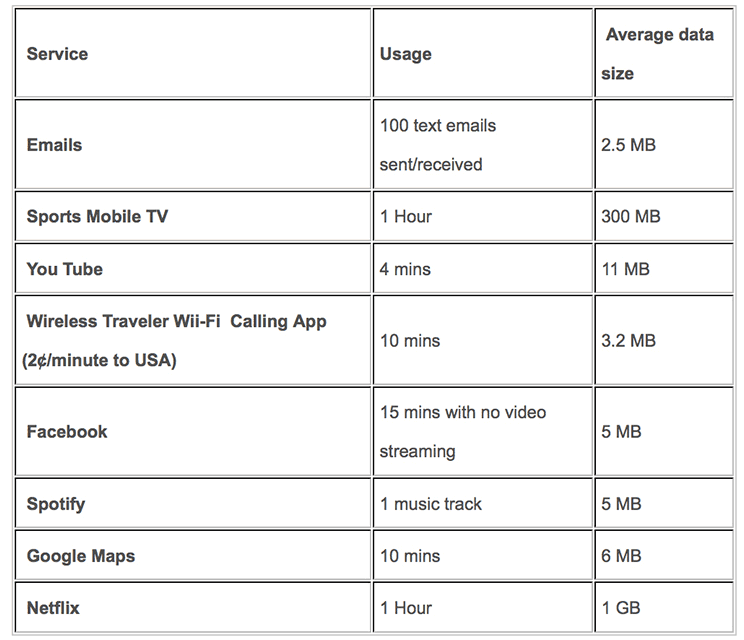 The chart below will give you an idea of how much data different services use, based on a typical amount of usage. Please note that these are estimates only – data usage volume can vary by device, type and quality of content. 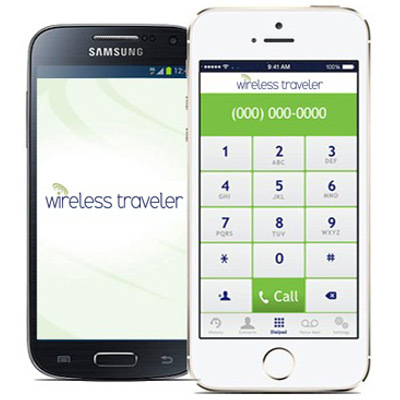 If you are traveling in a group and need to stay in contact with each other, the Wireless Traveler Wi-Fi Calling App is the perfect solution. Not only can you call each other (with the app installed on everyone’s phone) for free, but you can make calls to landlines or other smartphones for as little as two cents per minute. Plus, it doesn’t eat up your data! 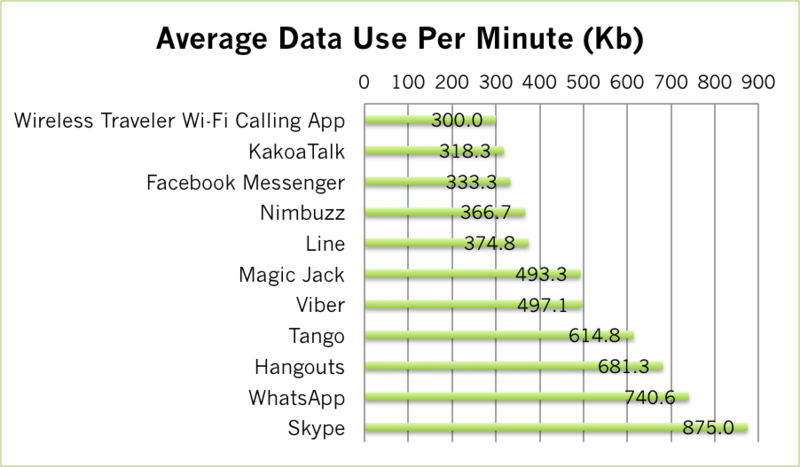 On the bar chart below, you’ll see that the Wireless Traveler Wi-Fi Calling App only uses approximately 300 Kb per minute. That means it won’t drain your Pocket Wi-Fi Hotspot as much as other apps, e.g., Skype or WhatsApp. The reason for its low data usage is that the Wireless Traveler Wi-Fi Calling App is strictly for phone calls, which also accounts for its crystal clear calls. Once you’ve determined your data usage, you’ll have a better idea of how much data to purchase. When you rent or purchase a Wireless Traveler’s Pocket Wi-Fi Hotspot, you can select the data plan that best fits your needs. You’ll be able to use the Wi-Fi Hotspot for all your smart devices and you can connect up to five devices at one time. Because it is a secure connection, you don’t have to worry about exposing your data (e.g., personal files and credit card details). The optimum range from device to hotspot is about 50 feet. You’ll experience optimum speed with no more than two or three smart devices connected to the Pocket Wi-Fi at one time; you might notice a slight change in speed if you tether more than three devices at once. If you have any questions about your data usage or which data plan is right for you, please call our friendly support team and we will be delighted to answer any questions you may have (1-866-700-3883) or via email at support@wirelesstraveler.com.